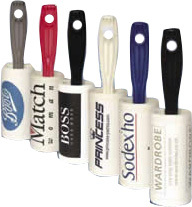 We can produce your own brand Roller Brushes for you with your logo & / or promotional message printed throughout the roll of very adhesive paper. With it’s 7.5 meters of super sticky printable tape it will remove fluff, lint, pet hairs and anything else from almost any surface. Your logo will be seen time and time again. To see our complete list of sticky roller brushes and refills please click here. This link will open a new window to our retail site.